Funeral service for the Boy in the Box. 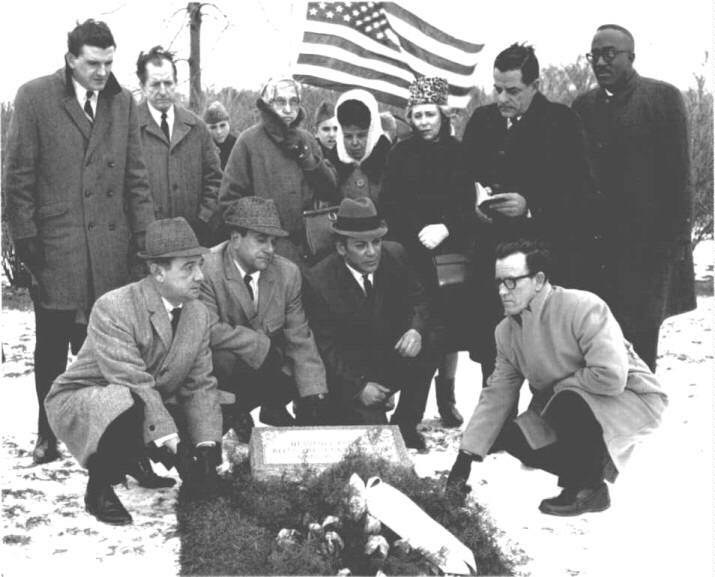 The Boy in the Box is taken to his grave: July 24, 1957. This photograph was taken outside the entrance to the Mann Funeral Home in Philadelphia. The identities of some of the individuals in this photo have not yet been determined. 2nd from left (wearing glasses), is James McGovern - Asst. Chief Investigator for the O.M.E. The first pallbearer on the left is Det. Samuel Powell of the Philadelphia Homicide Squad. Directly behind Det. Powell is Alan Ressa, also an Asst. Chief Investigator for the O.M.E. Standing in the doorway is Joseph Kelly, an O.M.E. Investigator. Directly behind the casket (wearing glasses) is Dr. Joseph W. Spelman, the Chief Medical Examiner. The first three individuals to Dr. Spelman's left are Chief Inspector John J. Kelly of Homicide, Dr. Joseph E. Campbell - Deputy Medical Examiner, and Lester Avrick - Administrative Services Officer for the O.M.E. Leading the procession is the funeral director, Mr. Mann. The funeral party arrives at the City Cemetery. 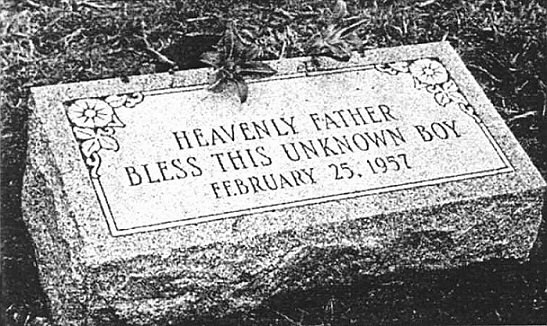 The unknown boy's original headstone. 10th Anniversary observance at the unknown boy's grave. Kneeling (left to right): Jack McKenna, Alan Ressa, Tony Primante, Jim McGovern. 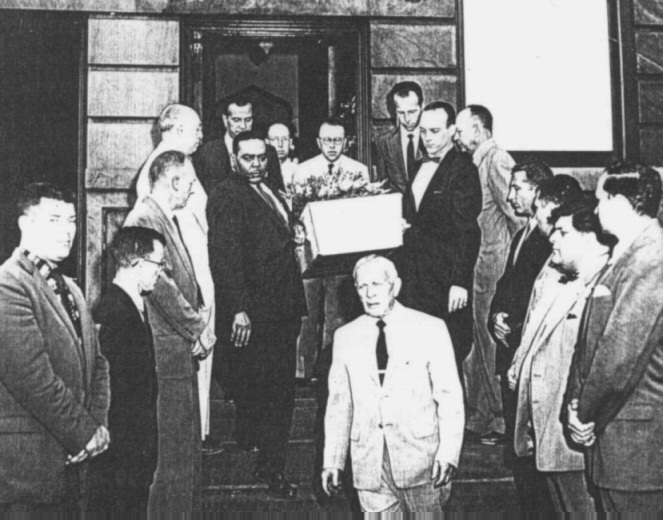 Standing: Joseph Aloisi (far left), Remington Bristow (2nd from right), Luther Lassiter (far right). All of the identified individuals were staff investigators for the Philadelphia Medical Examiner's office.